The National Hockey League Broadcaster's Associations gives out the Jack Adams Award annually to the head coach judged to have contributed the most to his team's success. The group named their three finalists for the award last night, and Barry Trotz of the Washington Capitals, Lindy Ruff of the Dallas Stars, and Gerard Gallant of the Florida Panthers made the cut. Conspicuously absent from the list is Mike Sullivan, who was elevated to the head coaching position in Pittsburgh in the middle of December and took a disappointing and largely mediocre looking Penguin team and helped set off a turnaround that shot them up the standings. While the Professional Hockey Writers Association left Kris Letang off the list of finalists for the Norris Trophy, it's undeniable that they were choosing from a deep and talented list of prospects while doing so. The Broadcasters Association doesn't have the same issue - they dropped the ball by not even naming the best candidate for the award a finalist. Now, that's not to discredit the three coaches that were named finalists, because they do have legitimate claims to make. The Washington Capitals, Dallas Stars, and Florida Panthers each saw a marked improvement from the previous seasons and topped expectation for this season in the process too. The Capitals went from a team that was solidly in the playoff picture last year to one that ran away with the Presidents' Trophy this year. Both the Stars and Panthers missed the playoffs last year before rebounding to win their respective divisions this year - Dallas with a 109 point showing that was second best in the entire league and Florida with a 103 point showing and turnaround that still seemed to be a year or two away. Each team was noticeably better season before, but each team also had made significant strides in the offseason. The Capitals brought in Justin Williams in free agency and T.J. Oshie via trade, moves that made them a favorite in the Eastern Conference, albeit not one that was expected to do quite as well as they did. The Stars added Patrick Sharp to solidify an offense that finished 2nd in the league in goals per game in 2014-15, and they added Johnny Oduya to shore up their defense. The Panthers didn't make many big moves, though swapping Jimmy Hayes for Reilly Smith paid huge dividends, but for a young team with a lot of good young players taking a step forward like they did this season was certainly a possibility. But while those three teams all saw noticeable improvements from last season that can be traced to various things in addition to coaching, the Penguins saw noticeable improvements THIS season that stem almost entirely from a coaching change. It cannot be understated how mediocre the Penguins looked through the first 28 games under Mike Johnston. They were a broken and beaten team struggling to play a boring brand of hockey, one that saw Johnston completely misuse the roster at his disposal. If the point is to hand out the Jack Adams Award to the head coach judged to contribute the most to his team's success, it's impossible to make the argument for anyone other than Mike Sullivan. The Pens were 9th in the Eastern Conference when Johnston was relieved of his coaching duties, having gained just 33 points - a 96.6 point pace extrapolated over a full 82 game schedule, which would have placed Pittsburgh just ahead of the Flyers (96 points) for the final wild card spot. A bad possession team at just a score-adjusted 48.3 CF%, they'd see an immediate turnaround under Sullivan, who opened up the restrictive system that prevented the offensive stars from shining, and even though they lost their first 4 games under their new head coach to put them at a season worst 84.6 point pace, they'd post a 55.0 SACF% during those losses that would show the promise the team would have with Sullivan at the helm. Despite those first four losses, Sullivan would turn things around in the process of going 33-16-5 during the regular season as head coach - a 107.8 point pace over the course of a full season. He turned the Pens from a below average possession team to one of the best in the league, finishing 2nd during his time in Pittsburgh with a 55.3 SACF%. While Johnston's Penguins were scoring (2.39 GF/gm) at an unacceptably low rate that matched what their defense was allowing (2.39 GA/gm), Sullivan had them producing at nearly a full goal per game higher offensively (3.30 GF/gm) while not allowing significantly more defensively (2.52 GA/gm), and those numbers continued to improve over the course of his tenure. 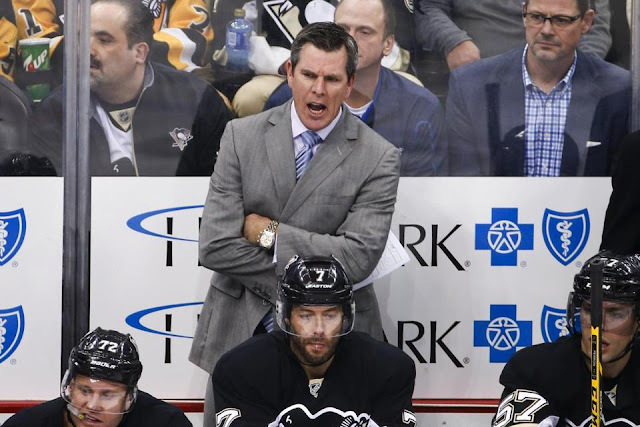 The Penguins had an even goal differential when they made the coaching change - starting already a third of the season in the hole, Mike Sullivan guided the team to a +42 differential on the season that placed them second in the entire league. It's true that Pittsburgh would add some key pieces over the course of the season, trading Rob Scuderi away for Trevor Daley, swapping David Perron for Carl Hagelin, adding Justin Schultz at the deadline, and giving a number of AHL players the chance to earn roles with the NHL squad. It's also hard to imagine that Johnston would have accomplished much more than he did even with the same changes to his roster, and the Pens are likely already solidly in their offseason if Johnston was given the full year. Instead, Sullivan led the Penguins to a 104 point finish, the 4th most any team finished with this season. Pretty good for a team that wasn't even 4th in their division when he was hired. Clearly, the Pittsburgh Penguins season turned around in a major way when they put Mike Sullivan behind the bench, and it was his vision that took off the shackles Mike Johnston put on the team and placed them in the best possible position to succeed. It was a turnaround that vaulted them to a 2nd place finish in the Eastern Conference and a 4th place finish league wide, and it was their head coach that was the catalyst. That's exactly what the Jack Adams Award claims to be recognizing, and with no offense to Barry Trotz, Lindy Ruff, or Gerard Gallant, but none of the three turned in a coaching performance anywhere close to that which Sullivan provided. Mike Sullivan was the clear cut best choice for the 2015-16 Jack Adams Award, and the National Hockey League Broadcasters Association royally screwed the pooch by not even naming him a finalist.